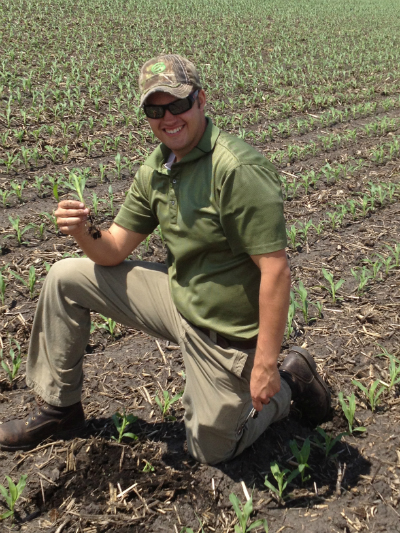 My name is Reed Nelson, I will be the intern for Corn Capitol Innovations for the summer of 2013. I will be a junior in college this fall where I am currently pursuing a degree in Business Marketing from St. Cloud State University. Having lived in Olivia, Minnesota for nearly 21 years of my life, I have developed a strong interest in agriculture and the businesses which make Olivia and the surrounding communities thrive. I enjoy playing guitar, hunting, fishing, and being outdoors in my free time. In the first month of my internship, I have participated in conducting Net Effective Plant Stands which are commonly referred to as NEPS. This process is a tool that is not only used to determine the success rate of a growers spring planting, but also show how decisions made in the previous fall, winter, and spring have affected the farming process. The NEPS process involves flagging and analyzing portions of growers’ fields. The flagging process involves identifying individual plants and determining whether they are: standards, skips, double plants, or a delayed emergence. After completing the flagging process, the next step is identifying the cause of the delays, skips, or doubles. This step is often carried out by digging to check for soil conditions, and planting depth. These complications can range from poor soil conditions, to weather related conditions, to malfunction of machinery used. By diagnosing these problems, we are then able to assess decisions made in the months prior to planting and how they may or may not have played a role in problems with stands. Once Net Effective Plant Stands are complete, the rest of my summer will include activities such as scouting fields for harmful insects and fungi. I will also gain experience through observing varieties in our plots and learning more about the genetics involved in various seed products. With the summer just beginning, I am excited to expand my knowledge of agriculture through hands-on experience with the C.C.I. team. I also look forward to meeting and working alongside the customers of Corn Capital Innovations to help accomplish a safe and successful growing season.